Q: Please help us with our remodeling problem. 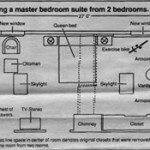 Now that our children are grown, we would like to creÂ­ate a master bedroom suite by removing the wall that now separates our bedroom and another smaller bedÂ­room. As you can see in the drawing, it's unfortunate that the chimney stack must remain because it juts out right in the center of the space. How do we work around that, and which of the hall doors should be reÂ­moved? 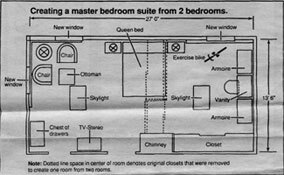 I also need to know where to put the closet and how to best lay out the furniture. We will be keeping our queen size bed, but everyÂ­thing else will be new. CurÂ­rently, we are in desperate need of storage space. We would like a TV and want to be able to view it from the bed as well as from a comfortable chair. Another problem is what to do with the windows. The corner windows in our curÂ­rent bedroom are 38 inches wide by 55 inches high. The window in the other bedÂ­room is much wider, but also a lot shorter (71 inches wide by 36 inches high). Should we replace, remove them, or move them? We've also been considÂ­ering skylights. Do you think that's a worthwhile idea? The heaters are cast iron baseboard. We want to leave them and not block them with any large pieces of furniture. We have waited 26 years to have a comfortable reÂ­treat and would be most build a wall of closets to the left of the chimney stack. A: In graphing out your new room, I quickly came to the conclusion that if you could build a wall of closets to the left of the chimney stack. Doing this would mask the fact that it protrudes into the room in a very conspicuous spot. You will also have increased the size of your closet by more than a third. Next I centered the bed onÂ the long, outside wall, opposite the door. If at all possible, I always think it's preferable to place the bed, especially a large one, straight ahead of you as you enter the room. Its size makes it a focal point, and it presents much better than if you were looking at it from the side. Centered in the room, it also serves to divide the space into thirds. You now have a sleeping area in the middle of the room with a dressing area to one side and a sitting area to the other. The dressing area would, naturally, be located by the closet. On the adjacent wall, I placed two large armoires with a vanity between them. The armoires provide a lot of storage and the vanity would be an ideal spot to sit and brush your hair or apply makeup. Many vaniÂ­ties have tops that lift up with built-in lighting. Not only would the vanity be convenient, but it would eliminate congestion in the bathroom. The chair that is used for the vanity could also come in handy when dressing. To the left of the bed would be the sitting area. I placed two chairs and an otÂ­toman in front of the corner windows to take advantage of the dual exposure and natural daylight for readÂ­ing. Between them I put a round table and a lamp. In the same general area, you could also have more than enough space in front of the window to place some type of exercise equipment if you wish. I then placed a tall unit (either open or closed) to hold the TV, on the wall beÂ­tween the bathroom and the door into the room. This unit can also house your VCR, stereo, books and possibly even a desk if needed. To the right of the bathÂ­room door, on the outside wall, I placed a tall chest of drawers. If you were lackÂ­ing storage space before, you certainly shouldn't be now. As for the windows, I would definitely change them. In the sitting area by the corner, I would either add another 38-inch wide by 55-inch high window to both sides or replace them enÂ­tirely, whichever makes the most sense aesthetically and financially. At the other end of the room, I would remove the wide, short window and inÂ­stall one that is the same width and height as the othÂ­ers for balance. Your new, well-deserved retreat serves many funcÂ­tions and, I hope, meets all of your needs and desires. Enjoy it.